With an interest in shedding light on and drawing to attention lost and hidden narratives in the history of art, Polish artist Goshka Macuga's practice sits between that of an artist, a curator and a collector. The original Kabinett der Abstrakten was a modernist wunderkammer made by El Lissitzky in 1927 after a commision by museum director and art historian Alexander Dorner. 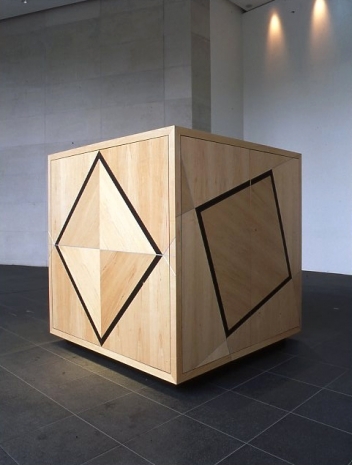 Dorner had a passion for experimenting with exhibition making and modes diaply and devised the cabinet to be a device for containing and exhibiting art works and objects. Macuga's exhibitions frequently feature works by other artists. Whether contemporaries such as Olivia Plender, historically significant figures of the recent past such as Andy Warhol or Paul Nash, or unknown artists whose work has been sourced from charity shops, they are treated with a democratic sense of equality. Objects are gathered together for the duration of a show and then dispersed back to their homes in private collections or museums. 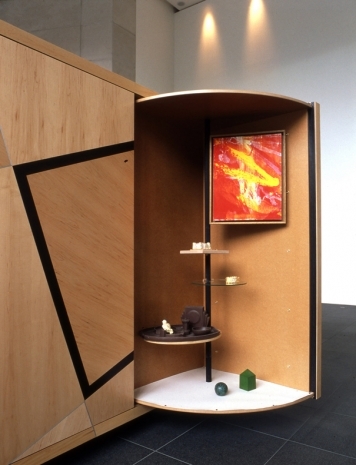 Her Kabinet (a remake of the Lissitzky original) has been exhibited several times, each time housing a different set of objects, relevant to the exhibition's themes and context. The work becomes a pedestal or plinth for the work of others, while at the same time tying the objects contained within it into the history of the Russian avant garde and a history of experimentation with modes of display.